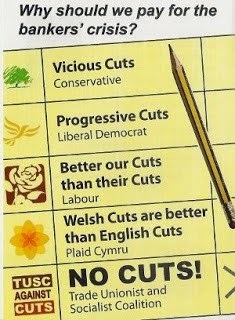 Swansea Trade Unionist and Socialist Coalition (TUSC): Labour Council Cuts: Better for whom? Labour Council Cuts: Better for whom? One of the justifications Labour councillors often use when voting through cuts is "it's better that we make cuts than somebody else does". This was one of the repeated phrases at the Council's budget-setting meeting when not one councillor was prepared to speak out, let alone vote, against £26 million of cuts to jobs and services just in this year. It's something I've never got! How can it be better to know that your job is being axed or outsourced by a Labour council? How can it be better to know that a service you rely on is under threat of being axed by Labour councillors? If you add in 3 little words: "get paid to" it makes more sense. As in "better we GET PAID TO make cuts than somebody else does". The only people for whom Labour cuts are better than Tory, Lib-Dem, UKIP or any other political shade of cuts, are the Labour councillors getting paid to make them, as far as I can see. The Evening Post has been publishing this week just how much they are being paid: over £13,000 for a councillor, £31,000+ for a cabinet member, £52,000 for the Council Leader. The basic councillor's wage is more than some members of my union branch employed by the Council, in some cases on zero-hours contracts or for less than the Living Wage. And for many councillors this is an additional income on top of their 'day jobs'! As a Socialist Party representative, standing for the Trade Unionist and Socialist Coalition, I pledge to take only audited expenses - I don't expect to be paid for being a councillor. If elected, like all TUSC representatives, I will vote, speak out against and campaign against all cuts to jobs and services. TUSC demands the Council immediately stop exploiting workers through zero-hours contracts, including contracting services to firms that do. TUSC calls on the Council to stop stalling and immediately implement the Living Wage as the first step towards TUC policy of £10/hour.